In the aftermath of Vancouver's last regulation defeat, a 3-2 home loss at the hands of the St. Louis Blues, Province writer Jason Botchford questioned questioned the Canucks' grit. "The Blues forwards were rarely touched," Botchford wrote, "Even after they shoved around Luongo. In one incident, BJ Crombeen took a shot at the Canucks goalie without even getting a passing glance from the rest of the Canucks." But it's not as if they didn't see it. You know if Botchford saw it, the Canuck players did too; they simply chose not to respond. This is uncharacteristic for the Vancouver team fans have come to know. In fact, Vancouver has long held a reputation for employing spirited chirpers and pests who can't help but get involved in scrums around the net, especially in the Alain Vigneault era. Canuck games, especially against past postseason opponents, are always full of spirit and high in penalty minutes. In the past, reactionary chirping would have been automatic, but that appears to have changed. Rather than engage teams who take cheap shots, this year's Canucks simply ignore it, put their heads down, and make their line change. It isn't that the Canucks are missing that gritty element, they've merely decided to opt out. We've all seen the signs; I just don't think anybody's fully touched on what it is we're seeing: clearly, there is an organizational mandate to play with focus and composure, leaving antagonism and agitation to less talented teams. The evidence is everywhere. Not only are the Canucks avoiding the action after the whistle, but they've suddenly quit arguing penalty calls. That's paying dividends, as their penalty minutes have been severely reduced. For the first time in Alain Vigneault's four seasons behind the bench, the Canucks are among the top five teams in the NHL when it comes to avoiding the sin bin. Only four teams have less penalty minutes. Prior to this season, the Canucks have finished in the bottom five three times, the bottom two twice. Their previous best year was 2006-07, when they finished 19th in the NHL. And don't think this is because they've cut down on fighting. The Canucks still have the 6th-most major penalty minutes in the league. It's avoidable minor penalties that have been excised, especially ones based on reputation and retaliation. The Canucks made personnel decisions based on the new Zen approach to their game. In the offseason, they chose not to keep Darcy Hordicuk or Shane O'Brien, spirited, emotional guys who could blow up a scrum like few else. In their place, they brought in players known for their physicality during play. 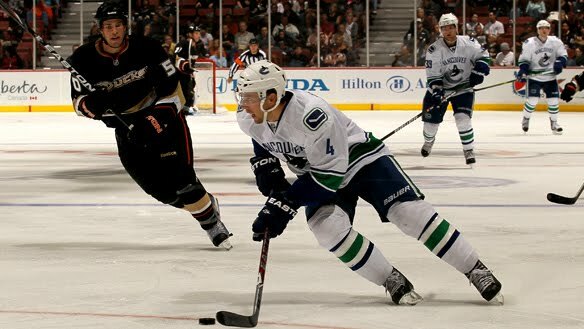 They were slow to replace Rick Rypien with another capable pugilist, and finally brought up the feisty Aaron Volpatti to play the wing on the fourth line. Even Volpatti is suddenly playing composed, controlled hockey, and talking about "picking your spots." He's been read the riot act, and he's fallen in line: he has more NHL goals than penalty minutes. “When I coached Ray in Boston, Ray never said a word to anybody,” Canuck associate coach Rick Bowness said. “The puck dropped and Ray played his heart out every game. That’s what you knew you were going to get. You couldn’t throw him off his game; he just kept coming. And that's how Kes is playing right now. Not too long ago [...] Kesler could be distracted, caught up with verbal jousting and settling scores. It's a combination which can lead to losing composure and taking penalties. He has made some changes. Maybe they haven't left him with more points, but they have made him a better player. And now the points are starting to come, too. This change was necessary, especially after the Canucks' last two playoff losses. Two years in a row, they've held a lead in the series only to lose their composure and set off a string of mental mistakes. Two years in a row, their top stars have lost their game trying to find retribution. In their attempts to meet the Blackhawks' superior grit with grit of their own, the Canucks stopped playing their game and locked themselves into an uphill battle. Last year it was a tough way to lose out to Chicago. We weren't mature as a group and weren't really ready to face that kind of pressure. Being a top-line player and playing with the twins, the managers and team wanted me not to get involved with scrums as much or get under people's skin as much. They have me focusing on making plays and scoring goals. It's about being a plus player out there while being a good player defensively. You know when the Canucks are asking their best pests to avoid scrums and agitation, they expect the rest of the team to follow suit. So far, they've gotten a total buy-in. In the last game against the Blackhawks, Christian Ehrhoff was the most visibly emotional Canuck. In the game against the Toronto Maple Leafs, former Blackhawks Kris Versteeg attempted to agitate Keith Ballard in much the same way he'd successfully agitated the Canucks in last year's playoffs. Rather than retaliate, Ballard unemotionally ignored the bevy of slashes and cross-checks. Versteeg was eventually called for an infraction. Then he argued the call, and was assessed a second penalty. The end result was four minutes of power play time for the Canucks because Keith Ballard kept his composure. Time will tell if the Canucks can keep this up, especially as other teams begin to attack their Zen-like approach. It will help if their powerplay can stay strong and discourage teams from taking cheap penalties, because that's where the Canucks will find their payback. They don't want to play gritty; they want to play hockey. They must continue to remain calm under pressure; to stay focused on the moments between whistles and not the moments after them; and, to keep their composure when opponents try to rattle them. If they can do that, they've got a pretty good chance to do quite well for themselves. Edit: this article initially misrepresented some of Jason Botchford's opinions. The final paragraph has been changed to correct this. Excellent, excellent post. I agree 100% with you on the composure and I love it. I was so frustrated and upset with how they just gave into emotion in Games 3 and 4 last year against the Hawks and let the series slip away, and I am very happy to see that is on the way out. Chickenhawk, seriously, cut it out. I don't mind the occasional trolling poem, but it would be nice if it related to the original post and was actually a new poem rather than one you posted in a previous reply. Can Ryan Kesler Get Even Better? Wellwood's World, Chapter 4: Wellwood Speaks!